The profit simulation model was developed to assist call center administrators in projecting potential revenue and expense associated with a particular auto dialer campaign. Additional variables needed beyond other simulations include project revenue per sale and percentage of close rate. On the expense side, the administrator must consider more definitive estimates including the telecommunication cost and the unit labor cost associated with the call center agents. The purpose of this simulation is to closely estimate the profit that will be realized from a particular dialing campaign. Since this campaign is based upon revenue resulting from a phone sale, this model only applies to commercial marketing campaigns. The auto dialer model simulates outbound phone calls placed by a automated dialing phone system with answered calls being connected to live agents. Calls can be made predictively, i.e. calls made even when no agents are currently available, "predicting" that when a call finally reaches an individual, an agent will be available. However, the predictive option was disabled for this simulation. An autocall dialer only places calls when an agent is known to be available to handle the connected call. 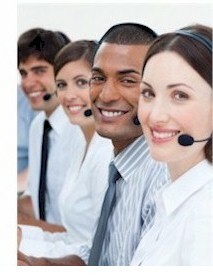 The following is an example of the results this call center profit simulation program can produce. Phone Campaign Delivery Type - This is the type of phone campaign that is to be simulated. Live Answers - Dialer delivers message to live answers, ignoring answer machines. Live Answers / PT/PD - Dialer contacts Live Answers with either a message and "Press Through" or connects call to Predictive Dialer (PD) agent. Dialer ignores Answering Machines. Machines Only - Dialer only leaves messages on answering machines ignoring live answers. Live Answers / Machines - Dialer delivers recorded message to both Live Answers and Answering Machines. Live Ans/Machines/ PT/PD - Dialer contacts Live Answers with either a message and "Press Through" or connects call to PD agent. Dialer leaves message on Answering Machines. Phone List Size - This is the number of phone numbers contained in the list provided to the auto dialing system that will dialed. Number Of Lines Dedicated To Dialing (Not Including Agent Lines) - An auto dialing system comes with any number of digital or analog phone lines. All or part of this configuration can be dedicated to running a particular predictive dialer campaign. This is the number of phone lines that will be used for dialing the above list of phone numbers. Number Of Agents Handling Calls - The number of agents that will be handling connected phone calls. The phone system dials numbers from the phone list and when a "live answer" is detected, the call is transferred internally to the next available agent. If no agents are available, the call will be suspended. Number Of Passes Attempting To Contact Each Number - The auto dialer system can attempt to re-dial phone numbers that were originally answer machines, busy or no answer. If more than one pass is requested, the campaign will require additional time to complete. Generally a auto dialing campaign will make a maximum of three attempts to complete a call. Average Talk Time Call Length (Seconds) - This is the length of time on average that an agent talks with a call recipient (in seconds). (live answers detected) - auto dialer detects a live person answering the phone call (default 32%). Estimated Dialer Costs and Projected Sales Data - This is an estimate of quality of the sales campaign and profitability that may be achieved per unit sale. Costs are likewise estimated. Single Unit Profit - This is the average revenue achieved when each unit of product is purchased as a result of a successful phone sale. Hourly Labor Cost - This is the average labor cost per hour associated with each agent. % Close Ratio - This percent represents the number of successful sales calls versus the total number of calls reaching Live Answers. Cent Per Telecom Min. - This is the telecommunications cost. It represents what is being paid to the telephone company per minute for each phone call. The above results demonstrate how closely the auto dialer simulation approximated the input parameters set by the administrator. Note the percentages of the input variables and the results achieved by the simulator were within a percent or two of each other. The particular model selected for this campaign was not a true predictive, rather a campaign that only dialed numbers when an agent was available. A 0% nuisance rate therefore was anticipated and observed. The number of calls connected to a live person was 35% of the original list. This equates to the original 32% simulator input parameter plus the number of individuals contacted during the second an third call attempts. The campaign was completed in 5 hours 40 minutes including the second and third pass at no answer, busy, and answering machine calls. The auto dialer campaign consumed approximately 3781 minutes of billable phone connect time. Of the 3500 calls that reached a live answer, 0 calls were unable to be connected to an agent because all agents were busy. This represented a 0% nuisance rate which passes FTC guidelines. Agents were effectively on calls 85.8% of the time which is less than published predictive dial results, but was expected because the dialer was not predictively dialing numbers ahead of agents becoming available. 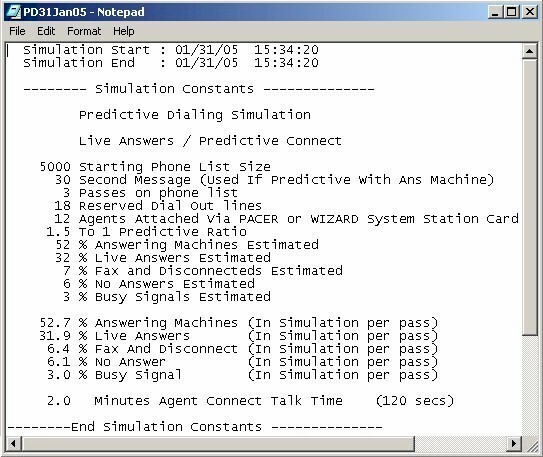 The auto dialer model successfully simulated the calling campaign where the dialer used 18 outbound lines and connected live answers to available agents. Model parameters and predictive throttle can be adjusted to operate within FTC guidelines. Contact DSC for a FREE analysis and simulation.